The ETMC is constructed from the fundamental phases and levels defined in POET. For the phases, we can consider the Methods being executed and the Culture that exists while they are executed. For the levels, we can consider the Artefacts being used and produced and the (technical) Environment used to use/produce them. The ETMC can be used in two specific ways. Point in Time assessment and post project reviews. In addition to the detailed maturity measures Pragmatic supplies, the Enterprise Transformation Maturity Canvas™ (ETMC) is perhaps a more pragmatic way of beginning to think about and assess an Enterprises maturity with respect to its Transformation capability. The ETMC can be used by printing and sticking these large sheets to a wall, or it can be done online, with people remotely collaborating using a web based tool. ¨ Green - Things which people think are good. ¨ Red - Things which people think are bad. ¨ Orange - Suggestions for improvement (a positive way of saying something is bad). To concentrate the mind attendees can be asked to consider projects they have worked on in the past or are currently working on, and think about what is good or bad about HOW those projects executed. This of course means that the ETMC could also be used in the future as a method for executing post project reviews, where the emphasis is not so much based on what people did or did not do, and critiquing them, but focussed on HOW things were done and critiquing the Methods Artefacts, Culture and Environment used. As well as being a much less confrontational approach, this approach is much more useful as the focus is on improving the system people work within rather than the people in the system. 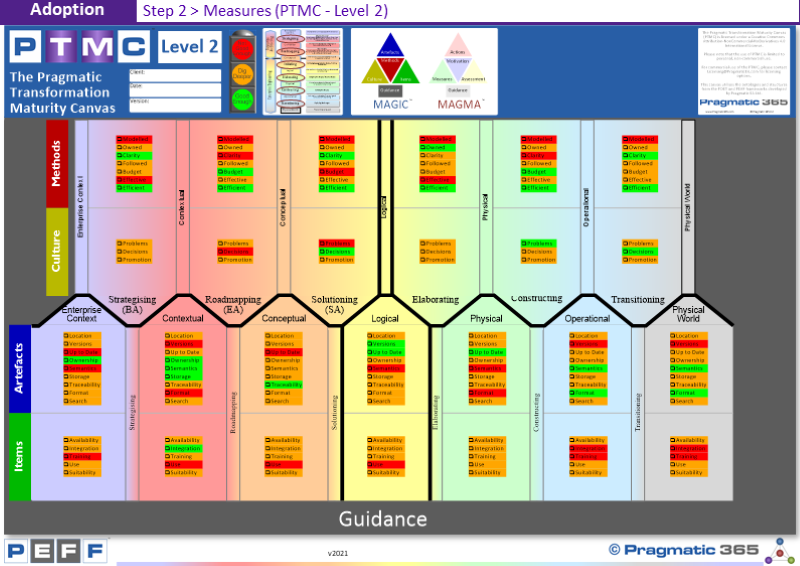 Do you think the ETMC is a good way to get a high level view of the maturity of your Transformation capability? How would your Enterprise fair?